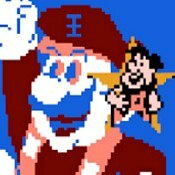 Description: 7 Grand Dad was hack of a classic Flintstones NES game but Mario was placed in it! Lol the title screen is funny, Has appeared in many Youtube troll videos! Now he's a internet Meme!! !